Who ever thought it would be good to tell your child to actually play with their food? But kids are curious, and a fun way to let them explore is by playing with food! But this isn’t just for fun. Playing with food can actually help your child develop their senses. Try these ideas to explore and develop the senses while playing with food. Make your own sand box. Especially if you live somewhere with a lot of snow, winter can leave kids longing for the park and the sandbox. Make your own “sand” box using cereal. You can play in a small 5 quart bin, it doesn’t need to be large and use it like it is a sandbox or hide a few of their favorite snacks inside for them to find. Draw pictures. This activity is a 2-in-1 for both sensory and fine motor development. Spread out some whipped cream, pudding, or applesauce and let your kiddo draw shapes or letters with their finger. This is also good for little ones starting to eat purees. 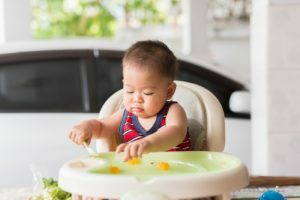 Put some of it on their high chair tray, and although you may not get shapes or letters, let them play around in it and feel a texture that might be new to them! Make a discovery bowl. Make some jello with your toddler and put a few edible snacks inside such as fruit. A clear bowl works great so they can see the items inside, too! Then ask them to squish their hands in the jello to find the items. Make it a game by asking them to find a certain one or something of a certain color. Stay warm with some cocoa. Give your little one a bite size marshmallow to smell, squish, or dunk into their drink. Be sure to talk about how the marshmallow changes and feels after it is dipped in the hot chocolate. Let them be the chef or baker! There are great sensory experiences that come with cooking. Try letting them help by kneading dough or mix ingredients. Find more ways cooking benefits kids in our How Kids Can Help in the Kitchen blog post. Make a cereal necklace. Put some dry cereal aside for this fun, after-breakfast craft. String fruit loops or cheerios onto a piece of yarn and tie the two ends together. Fine motor skills are put to use during this activity and the kids may not have felt their cereal without milk before. This fun way of playing with their food can also be a snack for later! Do a blind taste test! Cover your little ones eyes with a headband or small towel. Give them different foods to touch such as dry pasta, a pineapple, or a carrot. Ask them to tell you about how it feels, the temperature, and how it smells. Have them guess what food it is! This could also be fun with the same food in different forms, like an orange with and without the peel. Some kids may not like the blind taste test. If this is the case, do not force it. Instead, just have them describe the food and try to think of other foods that feel similar. Different foods have such a variety of tastes, smells, and textures. This makes it great for sensory exploration! Want more info on children’s development? 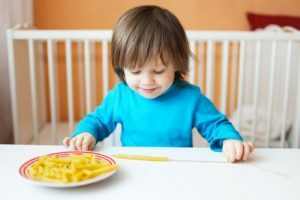 Is your child a picky eater? Or a problem feeder? Did you know bath time can be sensory time? Make this part of your daily routine into a sensory experience. Next Next post: What is a Pediatric Occupational Therapist?